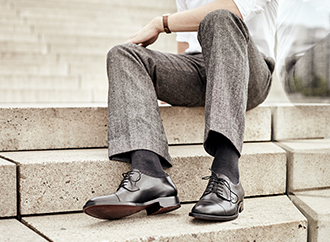 Heinrich Dinkelacker does not just offer luxurious, sewn-welted shoes. As the oldest shoe brand in Germany with a comprehensive range, we also guarantee our business partners complete planning security, an in-depth exchange of knowledge, a high degree of product availability as well as appealing sales modules that are as customisable as our masterful, handcrafted footwear. Do you share our passion for sophisticated, handcrafted men’s shoes, and are you interested in long-term collaboration? Get in touch with us now — together, we will shape the retail of the future!